There's a plethora of annual events on the royal calendar to look forward to each year, and one of my favourites is the Queen's pre-Christmas luncheon. It's traditionally held a week or so before Christmas Day when the seasonal atmosphere is in full swing and the festivities are just days away. Kate, Harry and an adorable Prince George were photographed arriving at Buckingham Palace. Royal reporter Emily Andrews said Princess Charlotte was also in the back of the vehicle. Prince William was absent from the event because he attended a memorial service for Guy Pelly's father in Wiltshire. The royals usually stay for two hours or so. It is the sixth consecutive year the Duchess has attended the luncheon. Below we see Nanny Maria Teresa. It's also one of the few occasions when so many members of the Royal family assemble at Her Majesty's request. Roughly fifty guests gathered today allowing the Queen to catch up with distant relatives who will disperse to their choice of destination for the holidays. Attendance at the event is said to be very important to Her Majesty, and family members rarely miss it. Traditionally, a couple of days after the luncheon the Queen and Prince Philip depart London for Sandringham where they will welcome their children, grandchildren and other relatives. William and Kate will also make the trip to Norfolk shortly, where they are expected to join the Royal family for present opening and a lavish dinner on Christmas Eve before hosting their own Christmas celebration at Anmer Hall with the Middletons. It promises to be a very special year with the addition of Princess Charlotte. Lady Helen Taylor and her family arriving. Prince Eugenie was all smiles upon arrival. 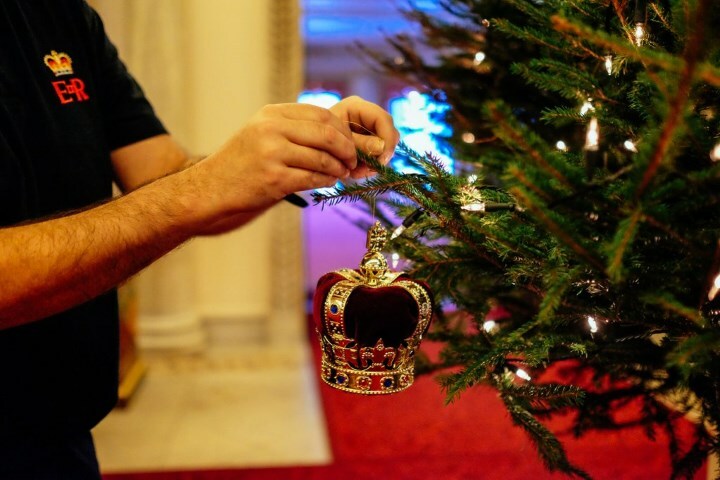 The British Monarchy's Twitter feed shared a photo of Christmas preparations underway at Buckingham Palace. The crown ornament is both very apt and an eye-catching addition to the tree. In surprising news, it was announced today the Duke of Edinburgh passed his patronage of the RAF Air Cadets to Kate during an audience at Buckingham Palace. I expected this most likely took place after the luncheon. 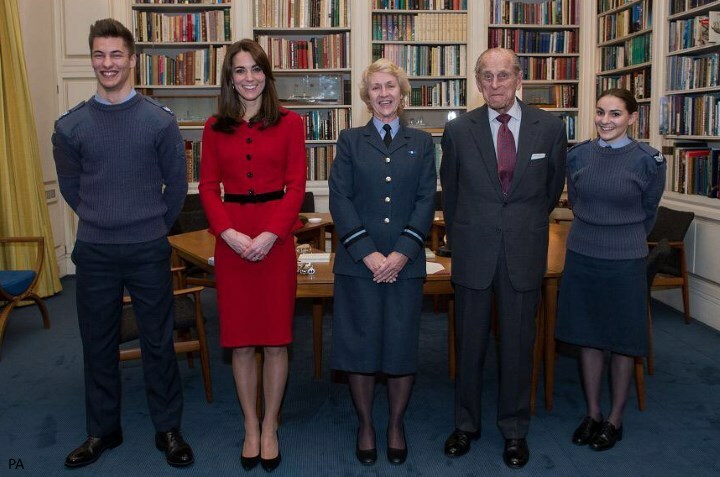 It is Kate's first role with an official link to the military and a very fitting choice given William's service with the search and rescue force and Kate's grandfather Peter Middleton was a RAF pilot. 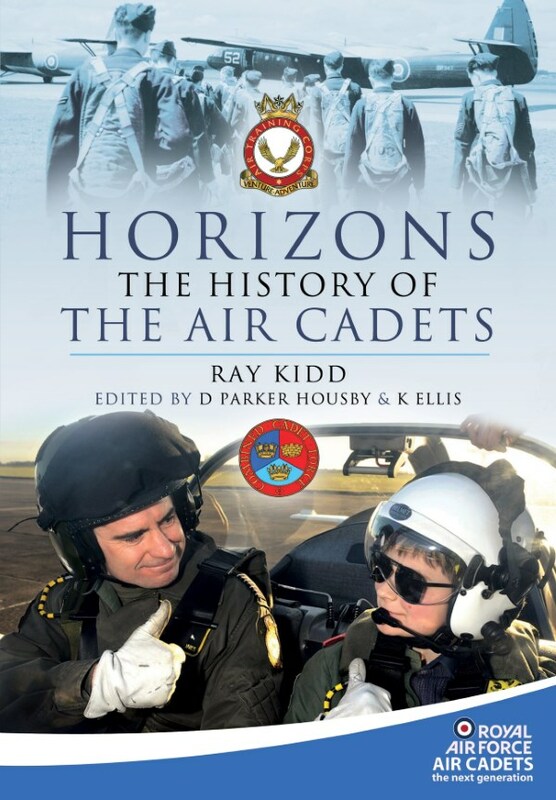 To welcome her to her new role as Honorary Air Commandant of the Air Cadets, The Duchess was presented with a copy of Horizons, the history of the Air Cadets, which sets out the proud history and traditions of the organisation she will represent. What Kate Wore noted the book is available at Amazon for £22. The Duke relinquished the role as Air Commodore-in-Chief, bringing to an end his 63-year patronage of the Air Training Corps. The Duchess becomes Honorary Air Commandant of the Air Cadet Organisation, an organisation of 42,000 air cadets and 15,000 adult volunteers at more than 1,200 units across the UK and abroad. 'His Royal Highness became Air Commodore-in-Chief of the Air Training Corps in 1953. The Duchess of Cambridge will become Honorary Air Commandant of the Air Cadets. As announced in 2010, The Duke of Edinburgh intends to stand down from a number of patronages with which he has been directly associated. His Royal Highness remains Patron or President of 780 organisations or charities. 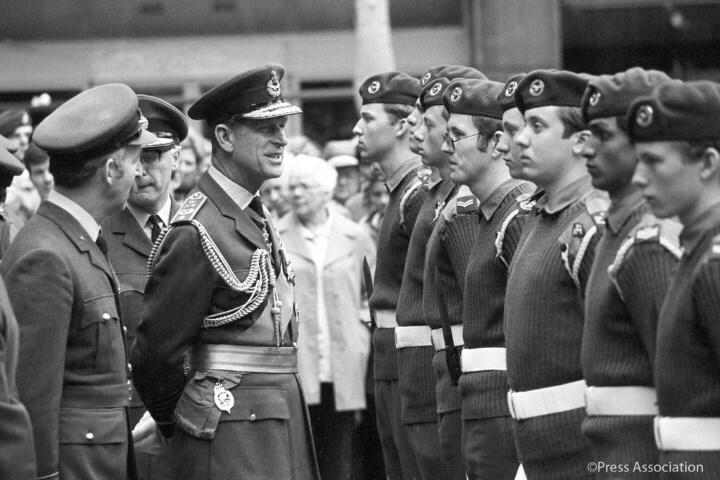 There's quite a royal history with the air cadets. Prince Philip took up his appointment following the death of the Queen's father King George VI who served as founding patron. Today, Prince Philip passed it on to Kate who will remain in the role for decades. I expect it may be the first of a number of the Duke's patronages Kate will take on. 'The Duchess of Cambridge has a close affiliation to the RAF following her husband's service with the Search and Rescue Force.The Duchess assumes her new role on the eve of the Air Training Corps’ 75th anniversary which will see cadets celebrate throughout 2016. 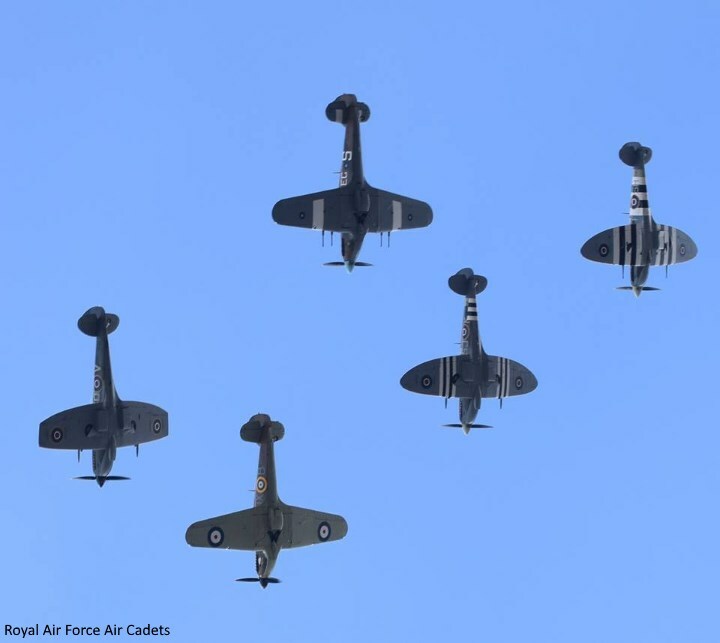 There are a whole host of events planned to mark the 75th anniversary next year. At least a couple will likely be on Kate's agenda offering the Duchess the perfect introduction to the organisation as their new patron. 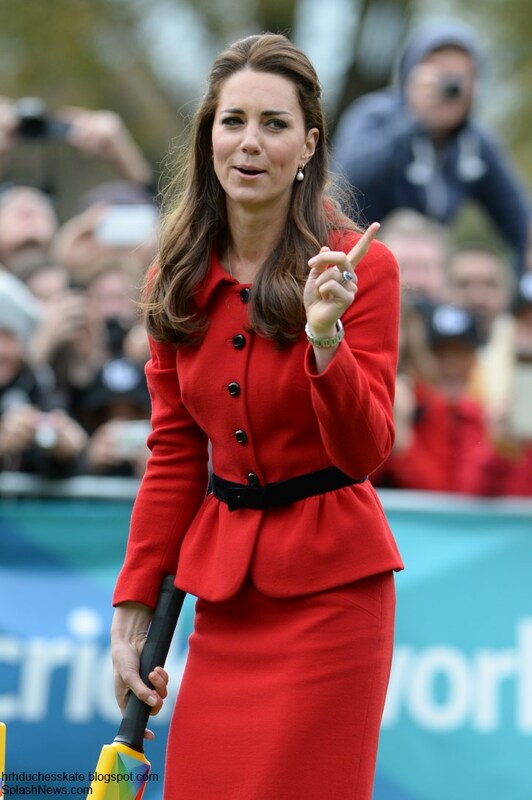 Kate selected her red Luisa Spagnoli suit for today's events. The Duchess first wore the suit in 2011 at St Andrews University for a pre-wedding engagement. Kate purchased the suit for £495 at Hollie de Keyser (a boutique frequented by the late Princess Diana when it was known as Emma Somerset) five years ago. Kate had the dress altered into a skirt and wore it again in Christchurch last year. It's a very stylish suit and a festive choice for the occasion. For those fond of the suit, we've added a great alternative to our Repli-Kate page. Kate sported her go-to Stuart Weitzman Power Pumps. 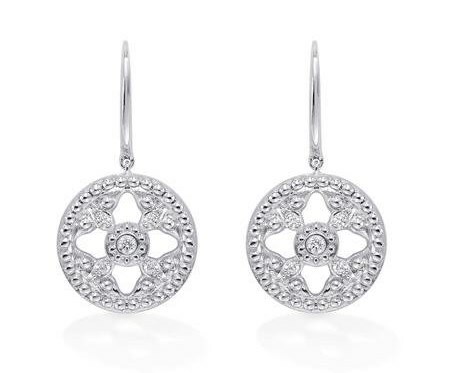 It looks like Kate accessorised with her Mappin & Webb 'Empress' earrings. It proved to be a very interesting day indeed with news of a new patronage for Kate. It was also a lovely opportunity for the family to catch up at the luncheon and of course always a treat to see Prince George! Her observation is from pictures only as she says. Charles' window looks pretty blacked out as well. The Tindall's rear window is also blacked out and so is Lady Helen Windsor's. Nevertheless quite clear pictures of Prince George were taken and I also think Princess Charlotte is next to Catherine. Yes another article confirmed that Charlotte was there. As for the blacked out rear windows, that is simply not true. Looking at the pictures others including the Gloucesters and the Tindalls had dark rears too. I'm not that bothered about the windows one way or another, I was more interested in her Charlotte tidbit. I included her observation on the windows since she seemed to think it bolstered the theory/likelihood that Charlotte was in the car as well. If Maria was there, I feel almost certain Charlotte was by her side. Although Maria could be present to corral the very active "little monkey", George, so he won't bring down the palace. There are a few breakable and somewhat valuable things in there. Not to mention a slight entourage of some perhaps frail royal's in the mix. The Daily Express confirms that Charlotte was there. I am not an admirer of Emily Andrews as a reporter. She is snide, often steals other people's ideas is quick to jump into her own conclusions without examining the facts. Well, I thought nannies were almost mandatory at this event since it's a dinner and such as well. And now especially that we know she had an event while there as well. Plus, she left in another car than them so it makes full sense. Charlotte is in the car with Kate. Emily Andrews posted a pic on twitter where you can see Charlotte's head. Bluhare, does this mean you must eat half a hat now? Oops, bluhare, no hat eating. Not work related abscence. Phew! Uhm... I have a feeling they are blacked out all the time so it wouldn't make sense to remove it for an afternoon? Charlotte posted a photo above of Prince Charles & the Duchess of Cornwall arriving in a vehicle with blacked out rear passenger windows -- so whoops. As for the kids, the photo issue probably takes a back seat [no pun intended] to the security concerns. I'm sure you'll get to see some lovely official portraits again soon. Prince Charles and Camilla appear to be sitting in a car with tinted windows, not blacked out. That's why pictures could still capture their faces without having to angle from the front like with Kate and Prince George. Also why Charles and Camilla still waved to the crowds, whereas Kate did not on the way in - she couldn't be seen from the outside while they still could. Also the Cambridges clearly have range rovers with blacked out windows and not blacked windows. Sometimes for Kate's engagements she arrives in the backseat but you can see her from outside. Same with when they left the hospital after George's birth. Zara Tindall's car also had a blacked out backseat but they don't receive royal funding and are also very open with Mia and pictures of her, so maybe that's why their situation is considered a little different. Last year Kate and William arrived separately from George in order to try and avoid pictures of him - I don't think the media is over thinking it when they interpret the blacked out windows of today as avoiding pictures of the children being taken. If they truly did not want any pictures they could have just left the kids at home because as you can see, not everyone was there. Many grownups and kids didn't attend. Again it's just another quick and inaccurate remark by one royal reporter. I am tired of their groans because I think William and Kate have been generous with sharing pictures of their children. They don't have to but they do. Plus it's a private event after all. Not sure why the jump to conclusion that the blackened out windows are to avoid pictures of the children. It is a big stretch and definitely overthinking! It is a very common occurance and mostly done for sun glare. It is not a process that can be removed at will. Just another thing to criticize and for the media to manufacture another story! Could be to shield them from the flashing maybe? Those flashes can be harsh! But, like much with the Cambridges, there are generally two very plausible explanations for their actions, one favorable, one less so. I don't know much about Emily Andrews I will admit, but I can vouch for Richard Palmer who said not only were they exceptionally dark windows, but that "the driver also accelerated through the palace gates with a crowd around. Most other royals slowed down. It looked dangerous. No doubt the driver will say he is trained to do this and the crowd had been told to keep back but it seems unnecessary." Given what we know about the Cambridges and photos, I think it's just as likely they wanted to avoid photos of Kate with both children (something no one has seen yet) as any other scenario. These gatherings of all the royals are very rare and will become increasingly so. The flash photography issue is a good point Rebecca, but doesn't explain the acceleration. Also - maybe someone knows this and can help me out - I seem to remember that photographers can't use flashes when taking pics of cars, the front anyway, which obviously makes sense. Yeah at this point, I just can't believe people are acting so indignant over the idea that the CAMBRIDGES of all people may have done something to avoid pictures. What about their history indicates anything other than we should be indignant at this point if people DON'T think that they were trying to avoid pictures?! Look, say what you will about them having a right to decide when and if their children are photographed. That's fine. But that's a different issue from whether or not they do a LOT to ensure full control over that issue at all times. I mean, after Charlotte's birth, when they left for Anmer, they had the front gates opened to trick the photographers while they snuck in a different entrance. Again, I'm not saying they weren't right to do this. But they have always done a lot to avoid pictures from being taken. Again, like last year when they either arrived or left separately from George. As for leaving the children at home if they didn't want pictures taken - do you really think this is seriously an option? George is expected to become the monarch at some point - having him, or Charlotte who is also close to the throne, not attend the Christmas lunch would be an insult to the extended Windsor family and the Queen - all of whom appear just fine with being photographed and probably would not understand a future monarch missing the event just to avoid some pictures. Especially since the Cambridges seem to do less royal events than most - i.e. most likely missing Christmas Day lunch 2 years in a row (if the media reports are right), not inviting royals to George's birthday parties, etc. Their vehicle was carrying the 3rd., 4th., and 5th. in succession to the throne. Maybe that's why they had tinted windows and sped through the gate. Was very surprised by the photo on Charle's and Camilla's Christmas card. So real and casual. I know the vehicle had some important occupants, but you could argue Charles is more important. It looks like I left a random thought in my previous comment, just saying that these gatherings are rare and people love to see them, either in person or through photos later. American politicians like to say "you win elections by firing up your base!" Well the people who stand outside to see the royals in person are about as devoted a base as you can get, failing to recognize that can be costly. Kate was photographed and videoed at length with her children at Charlotte's christening! My family has owned a series of mini-vans with tinted second and third seat side and rear windows. We did not order the darkened windows, they just came that way. I assume they are intended to lessen glare and make children riding in the back less visible. And, he wasn't even wearing his suit Jacket. Amazing photo. Changing things up quite a bit. Kate all took over as the Honary Commandant for the RAF Cadets today. Prince Phillip passed the torch to her after 63 years. She appears to be wearing the same dress. Pics are on Twitter. .. I'd like to be a fly on the wall for this gathering! Especially with Charlotte and George. I'll bet they are wide eyed in the midst of all the holiday splendor. I love the crown ornament. I hear the State Crown is incredibly heavy and headache inducing, perhaps they can switch the two? JK! The ornament kind of reminds me of the the tiny crown Queen Victoria wore due to her migraines. I love Harry's beard. He's the best looking ginger on the planet, IMHO. Thanks for the post, Charlotte and Merry Christmas. I hope you have a wonderful season with your husband, family and friends. All the Royals look wonderful! What a great day to be sanding outside the gates of Buckingham Palace. You could get pics of everyone! Prince George looks so big and so cute! I hope they all had a wonderful time celebrating and visiting with family. I know HM will enjoy hosting her loved ones. Happy Christmas! What a nice surprise! Honorary Air Commandant. Great pictures too. Kate looked terrific today, chic and gorgeous, as usual. 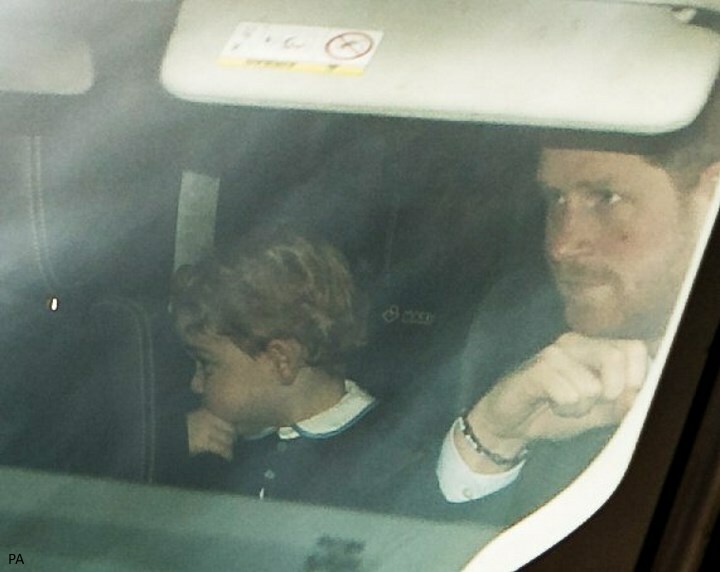 Fun seeing George in the car with his uncle Harry. Thanks Charlotte for getting all that out. Yes. Congrats to Kate - what an honor! And quite a lovely head of hair on Prince George. The post is updated with photos and info on Kate's new patronage. It's a very good choice for her and I expect the first of a number of Prince Philip's patronages she'll be taking on. Also, William was absent from the luncheon because he was attending a memorial for Guy Pelly's father. This assignment not only fits well with Kate's experience and interests, it also indicates Prince Philip's respect for her. I am glad to see this, as he can be of great help to her. flight affiliated also, although not military. I LOVE that HRH is broadening the organizational nature of her patronages. Very important to expand message that women can and should be involved in matters beyond child welfare (and, conversely, I've appreciated it when William gets involved in children-focused charities; vital for men to see that it is their business, too, so to speak). Anyhow, I believe HRH's associations with the Air Cadets might also be a nod to the Duchess's own family's role in the RAF. Back during the Canada tour, William mentioned that Catherine had had an RAF uncle who trained in Canada. Obviously, on that occasion the point was to highlight a connection/nice PR touch between Canada and HRH. We rarely learn information about the Duchess's family through official monarchy sources, but two salient occasions have been the Canada/RAF and the coding/her aunt episodes. 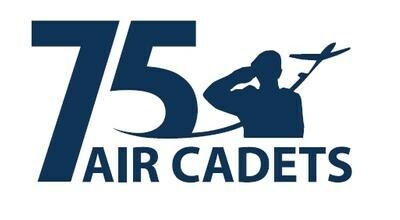 I believe that Air Cadets is something that not only matters to HRH through family history and her husband's role, but it is also a great way to create powerful connections/images around military service/British public at large/patriotism and the British girl who is queen-consort-in-waiting. It was Kate's grandfather who was a pilot in the RAF. I think it was also said that he flew with PrincecPhillip or knew him during their time. Yeah, he was the pilot for 2 months on a tour with Phillip appearantly and Phillip flew the plane sometimes with Kate's grandfather as the co-pilot. Or so I read :) Rather cool! Yes! Thanks for the correction. Silvia. I think it is really great news that PP passed this patronage to Kate. I found it a bit strange, but reading about her family history, it makes perfect sense. I hope we can see George and Charlotte although there is a big silence over the kids photos. It would be nice to see them both. On fashion note, I love this suit, I wish she would pick more like this. It looks very professional and neat and perfect. Fast as alwyas Charlotte!! Thanks!!! Prince Phillip purportedly gave Peter Middleton a pair of gold cuff links along with a letter of appreciation for the times they had flown together. I have hoped that perhaps Prince Phillip may have even attended Peter's funeral as I don't know how many of Peter's contemporaries would have still been around and Prince Phillip is an honorable sort of man, knowing that in addition to flying with him, he had trained pilots during the war. It would have been a real blessing for him to honor Kate by attending also. I think the funeral most likely would have been very private and low key. The locals seem to be very protective of Peter's privacy concerning his famous granddaughter. Hopefully that happened. Peter Middleton died right before William and Kate's engagement was announced. They delayed it a couple of days for the funeral. William attended with Kate. Philip attending Kate grandfather's funeral may have brought too much scrutiny. Plus Philip has a heavy schedule and the funeral might be only close family. So appropriate and sweet the Prince Phillip would hand over the Air Cadet patronage to Kate, not only because William was in the RAF, but her paternal grandfather, Peter Middleton, trained British pilots during WWII and actually co-piloted many tour flights with Prince Phillip and was a friend of his. So, how apropo that he gift that to Kate. The fact that Kate love children is going to make it fun for her. The young, 18 year old man who was selected to be at that ceremony was very articulate in his comments. A very mature 18 year old. Funny how we Duchess Kate fans knew right away and made the Peter Middleton connection and many of the news articles about did not. lol They mentioned only William being in the RAF. So happy to see a photo of Kate with Prince Phillip. Peter Middleton must be in heaven smiling from ear to ear and being amazed by how God has worked things out, like his granddaughter marrying a pilot and a prince and the grandson of his friend, Prince Phillip. I hope he got to me William before he passed on. Thanks Rebecca. I remember that now. I imagine William had a lot of stuff to talk about with him about flying and WWII. I hope Prince Phillip attended Peter's funeral. Does Harry look as handsome as ever or does Harry look as handsome as ever. They may release photos of the children prior to their winter vacation, perhaps to deflect any bad press over their vacation. Not saying that to be mean at all. Just a possible PR ploy, that's all. Thanks for this post Charlotte. It was very good to see your post after a day of tears. On 16 December 2014 the innocent children were killed in army public school, pishawar. Pakistan... today was very hard for us its realy feels good to see this post. It must be such a tough day, I remember reading about the tragedy last year. My thoughts are with you Faiza. Faiza, it was really devastating. Sending my best thoughts and prayers to you and all the people from Pakistan. What a tragic day Faiza. I pray that someday the world can live in peace, respecting each other's right to their beliefs, so that we all may share this beautiful earth. Faiza, this world seems becoming more and more crazy. It's a blessing to hear your voice in this very international forum, thank you for sharing your sad feelings and for allowing us to share with you our thoughts and prayers. What do Rebecca Deacon and nanny Maria do during the 2 hour luncheon? Rebecca Deacon was probably there because of the meeting with the air cadets, so maybe she made last-minute preparations during the luncheon. Maria was taking care of George & Charlotte, I suppose. Rebecca Deacon probably only arrived for the patronage presentation. I don't think she was there for the lunch. Nanny probably has to be available to take the children if necessary. Most likely other nanny' s there for the other younger children as well. I think Nanny Maria looks after George and Charlotte. I read that the youngest royals don't seat at the same table of their parents.. I bet Maria probably also helps watch the other royal children as well - for example, Mia Tindall doesn't have a nanny and arrived without one, and she's probably not the only one, so the families who do have nannies probably share the nanny with those who don't for the purpose of this meal. I would bet you that Mia does have a Nanny. She may not be listed as a Nanny but her Mom can not do her horse riding without someone in helping, her level of horse training is intense, plus at her income level they all have help, they may not be called Nanny's but that is what they do. So she may have a maid service, that also helps with "child care" or a cook that helps out etc etc. 07:12, I agree. I think that Anne had help with Peter and Zara. I think they for sure have help with Mia. Anne's house is no doubt full of servants and always has been. Take the kids out, I am sure. No one would expect little ones to last through a 2 hour ordeal. As far as I've heard is that the kids eat at a separate place/table etc so everyone (who has one) probably bring their nannys. Agree, I suspect 90 percent of that group has a Nanny at least on "an call" basis. o way could you go to that lunch with a child or two or three in attendance and not have help. Rebecca Deacon might have come at the end of the luncheon just for the meeting Catherine had with Prince Phillip. The Nanny I assume is in charge of the kids at the children's table during the party. It looks like the photo of Rebecca Deacon is with Catherine after the event. It appears the Nanny arrived on her own or with another group before the party and then went home with the kids and Prince Harry after the party while Catherine was attending to her business. That is my speculation when looking at a variety of photos. Anon 20:57, I think you are quite right. There was a need for a nanny during the luncheon to care for tiny tots, one a baby, and a need for Kate's assistant for the change of patronage. Perfectly logical! Maria will have to be near the children at all times most likely. Rebecca? Don't have a clue. I was wondering why also was Rebecca there. It was a family lunch and last I checked she was not part of the royal family. "keeping Harry and George out of trouble" hahahahha, no doubt! I assumed they did the Cadet event after the luncheon, Same needs, a Nanny to watch during lunch and then take the kids home, in the car with Harry:)) as we saw, and Rebecca to be their for the Patronage event. Rebecca could have arrived at any time, highly doubt she was at the luncheon. Lovely post Charlotte! Minor, minor thing - if Kate first wore this suit in 2011 surely she purchased it more than 5 years ago, not 3? I have often wondered whether one of the reasons she has only taken on a handful of patronages was because when the older royals retire I am sure many of their existing patronages will need to be taken on by the younger ones obviously some patronages will finish but there are important ones that won't. Kate has accompanied the Queen or attended events at organisations that the Queen is Patron which makes me wonder whether eventually she might become patron of those. I thought Kate looked lovely today. 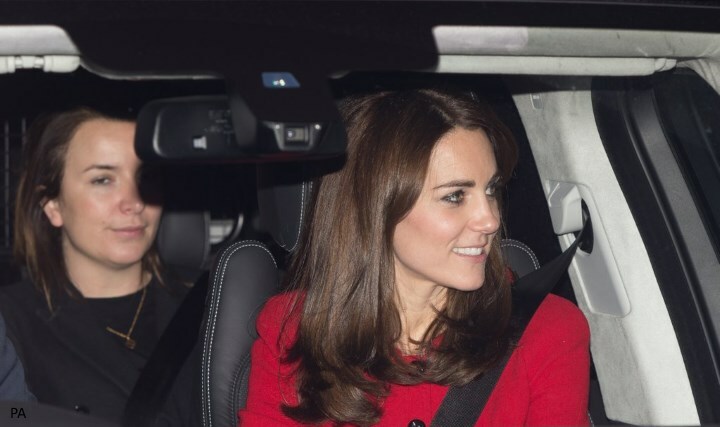 I think Rebecca Deacon was only there for the Patronage event as the photo of her in the car with Kate was taken when Kate left the Palace and it was just the two of them in the car. She will have been there for the formal ceremony. William attended a memorial service for goodness sake. Why must this turn into another "he prefers to be with his friends" accusation before the ink is dry on this post? I'm sure W/H/K discussed it and I don't see the need to have it turn into a dig at William. "I have often wondered whether one of the reasons she has only taken on a handful of patronages was because when the older royals retire I am sure many of their existing patronages will need to be taken on by the younger ones obviously some patronages will finish but there are important ones that won't." I think that is a big part of it! There are alot of patronages that will be without royal patron within 20 years or so, not only from the main line but also stuff like the Red Cross and Scouts and others that the more "minor" of the elderly royals are patrons of. Prince Andrew said that when Pr. Margaret and the Queen Mother died they all gathered around a game of cards and split the patronages between them. So it makes big sense to leave alot of spots open for the younger royals to fill as time goes on. That in combination with it fitting alot into how their life looks at this point, and it makes alot of sense. With Prince Charles' planned slimming down of the monarchy, I imagine a lot of royal patronages will have to be let go anyways. That doesn't really mean anything in terms of whether or not Kate is expected to take on a lot of older royals' patronages in the future - just a thought. Royalfan - My goodness, why not just let other people have their own opinions? Mary E makes a fair point - Kate and William are purportedly planning on missing the royal family's Christmas day lunch - why not let Harry be the representative of the brothers at the memorial so that William can at least make this Christmas lunch with his family? I'm not sure why W/H/K discussing it is relevant - they aren't perfect people and there is no reason to expect people to blindly accept W/H/K's decisions about an issue without discussion. And I understand that YOU don't see the need to have it turn into a "dig" at William, but frankly, I don't see the need for you to be making a dig at another fellow poster. Rebecca what a brilliant thought! I had never thought of that being a possible reason for so few besides that they are not next up and the desire to raise a family right now. William hasn't been "fratting" with his friends for quite awhile. Don't think he is partying down at the funeral. That gives Harry some special time with his "sister" and "little Harry in training", George. Hopefully some sweet time with his little niece also. I think W/K/H only take on few patronages because their work is more hands on compared to the older generation. I also think it is absolutely right that William attended the memorial service. Judging by his appearance, he might have a formal role in it. I even think both William and Harry should have attended the service. Christmas lunches happen every year. Some royals miss it. Memorial services happen only once and mean the world to the family involved. I highly respect William for his choice to attend the service for his dear friend's father. He needed to be there for his friend. These luncheons happen every year, he probably has never missed one. It would be different if he was missing a coronation or something. Maggie, I didn't attack anyone personally. I did express frustration at the need to turn an appearance at a memorial service into something negative against William. And my reference to it being discussed was intended to imply that it's their business, not ours. Private lunch, private memorial service. I guess attacking William and turning everything he does into a negative is just fine. And how on earth do we know (key word KNOW) what the family's Christmas Day plans are? Other than seeing them walk to and from church, the rest is private family time. I'm sure they respect and include both sides of the family. It's 2015 and Kate does have one too. Kudos for William for recognizing it. What does missing this lunch have to do with him missing Christmas Day lunch? The RF does formal dinner and gift giving on Christmas Eve. W&K do Christmas Eve and Christmas morning church with the RF and Christmas lunch with the Middletons at Anmer. Sounds like equal time with both families. Plus Anmer is only 3 miles from Sandringham. Its not like he won't see the RF at other times during the multiple weeks he will be there. You don't have to accept their decisions blindly but why find devious motivations behind everything. I agree Courtnee. The royal family celebrates german style. As we do here in Sweden as well. the 24th is the main day, and some go to church on the 24th (Here in sweden) and some on the 25th (In germany appearantly). So they are not at all snubbing the RF.. They have a nice scheduel that fits good with both the celebrations on the 24th with the RF and the 25th with the Middletons. How perfect is that? By the way, it is mentioned today that William joined the lunch after the memorial. Anyway what ever it is, I agree with Courtnee. This lunch is really more for the extended family that don't go to Sandringham. I have also always thought that William was closer to Pelley than Harry, so good for him for going. I have to say, deciding to go to a memorial service or funeral is a very personal matter. Especially as you get older and lose your own parents and the parents of close friends, some who you've known all your life. Losing a parent is a life changing event that you're never prepared for, no matter how old you are. I'm not really saying I agreed with Mary E, simply that I didn't think royalfan's outrage at Mary E expressing an opinion was warranted given that there are two sides to this debate. Many people have made fair points about why we should not see William in a negative light for choosing to attend the memorial - they are different than royalfan's "for goodness sake", etc., which barely made an actual argument and instead just attacked the poster for daring to say something negative about William. Royalfan, the blog is about Kate, and thus by extension, her husband. Us expressing judgment by saying something negative about them is no different than you expressing judgment to say something along the lines of "this proves how wonderful William is." It's all judgment based on speculation, regardless of if it is positive or negative. And, while the blog is about Kate (and thus William to a certain extent), the blog is not about your opinion on other posters. It's one thing to logically respond to what another poster says, as many people have done in this very discussion, for example by saying things like "it's not a snub of the RF because this is for the extended family", but it's another to simply be like "for goodness sakes......why must this turn into another...?!" without actually having much of an argument for why Mary E's opinion is not something you agree with. You expressed judgment at Mary E for daring to have her opinion, instead of just saying why you disagree with it. I'm just tired of it. Everyone is allowed to have their opinions. And of course we don't KNOW that the Cambridges are not spending Christmas Day with the royals. I'm sorry if I don't make it clear when I'm not treating something as fact - I guess I've gotten used to all of us accepting that 99% of our discussions on this blog are based in speculation, so I don't see the need to point that out every time. But I can see why that could get confusing. Yes. My points entirely assume that the media is correct about this. But given that negativity does arise from the Cambridges choosing to spend Christmas with the Middletons instead of the Windsors, I'd be shocked if it weren't true because I really think they would leak to someone that they are spending Christmas with the RF, just to avoid the bad press. But who knows. I do agree the Christmas lunch yesterday is for extended family - I guess my point was that William, as the future King, has an obligation to see his extended family for this holiday meal given that he will probably have no other opportunity to do so during the year. But I also agree that we don't know William's relationship with Guy Pelly, and probably can't make a judgment as to whether or not he should have gone to the memorial. Again, just thought there was another side to the argument that royalfan was ignoring. Maggie I don't mean to speak for royalfan but I really don't think she was questioning Mary E's right to an opinion, I think she was just a little exasperated :) And I understand her response, as I said, someone's decision to go to a memorial is very private and personal, and almost impossible to judge from the outside. As I have told my own family in recent years, sometimes we never know the extent of a relationship. Unless we know for sure that someone's attendance (or lack of attendance) at a memorial is inappropriate, we should leave it be. Claudia, thank you. :) You're take on my comment was exactly right. Perhaps that's why the comment got the reaction it did. Even the person who made the original comment sort of shrugged about it, and I don't think anyone could argue that William is higher on the pecking order than Harry. Perhaps William lost the coin toss. And perhaps royalfan overreacted to a somewhat musing post from where I sit. William does see the extended royal family at Trooping the Colour as well as during the Christmas luncheon, part of which he reportedly did attend. We don't actually know how Christmas at Sandringham is spent, other than that the royal family who are there attend two morning church services. It has been reported that Sophie Wessex's father is invited. The Linleys and Chattos seem to have been missing from the Christmas luncheon. I wonder whether they are all spending the holidays together somewhere, possibly in the south of France. The Queen and Prince Philip took the train to Sandringham the day after the luncheon to prepare for Christmas. I hope theirs is lovely. May you also enjoy a wonderful Christmas, Charlotte and all those here who celebrate Christmas. And may 2016 be a year of greater peace and attention to the needs of this planet! I think in overall we really did a good job and tried to be civilized here, I mean both sides. I hope next year, we gonna have less and less similar arguements because of differing opinions.Things can get frustrated and it seems it is a good place for all of us to let the steam off. I think that an opinion, no mind if it's "for" or "against", might have at least a little (also a very little is enough) evidence of reason. Therefore, reading that William likes to be "with friends instead than with his wife" when it's clear that he is going to A FUNERAL ... just makes me laugh. There is no logic in that, I am sorry. I can understand perfectly Royalfan's reaction, as mine was exactly the same. Oh, to be in the car with George and his uncle Harry. They must have a lot of fun together! I hope everyone had a festive lunch with the Queen. And Kate looked great! I love this suit and wish she would have more of them in her wardrobe. I could not agree more! I laughed to myself seeing George with his hand in a similar position to Uncle Harry's. Spitfires, both of them! I think Kate looked absolutely lovely today, and how cute is George with his wavy hair?! Red is a beautiful color on her, and the suit was perfect for both the lunch and the patronage presentation. Bravo! Thank you for this post. I hope you and yours have a wonderful Christmas! The photo of Harry and George is brilliant! Notice how their profiles and the way each is holding his hand next to his face is exactly the same. Nice to see a resemblance to Harry as the resemblances to the Middleton clan are more readily noticeable. I like how Kate often wears red to the Christmas luncheon. I've always liked the suit she wore again today. Her recycles have been really great lately. The message from the reader in Pakistan really pulled at my heart. I'm going to spare some thoughts and prayers for those families as they deal with a very tough anniversary. They should know that we haven't forgotten their loss and that we all stand against terror and those whose mistaken causes could ever support killing innocent children. I hope the love of this special season enters all our hearts! Merry Christmas! Oh, so nice the see Kate has a new patronage! RAF cadets are very lucky to have her and I bet Prince Philip will be very, very proud of her! I'm in love with Kate's new haircut! I love her in red and as for the haircut. I like it. Easier with two little ones and will still go into a ponytail. And as a fellow mom of little ones whatever makes life easier is important. Charlotte thanks for the informative and timely posts. I always stop what I am doing to read your posts as they are wonderful. This outfit was one of my very favorites when she wore it to St. Andrews. I really love it with the black turtleneck and boots. From one US Air Force family to the Duchess: Thank You for serving! This may have been mentioned when she twice this dress previously but did she have the skirt lengthened? It appears a solid inch hem was added. Thoughts? Rationale? It was originally a dress and matching jacket. She had the dress re-worked into a longer skirt. I believe that the skirt used to be a dress, and so when Kate had it altered for the tour down under she had the dress changed into a skirt so that the excess fabric could make the hem longer. It's good to see that Kate and Harry and most of the other passengers were wearing seat belts. Thank you for great coverage all year round, Charlotte. One question, please--since Kate was unaccompanied by William, who did she have to curtsy to? Do you think she actually did? Thanks, I am really rather curious about this! Ooooh, that's right. This is one of those occations when Kate is unnaccompanied in the company of the royal family! Interesting. It's hard to imagine that she would actually curtsy to Princess Eugenie but who knows, since they take all this rather seriously. Other than to the Queen and Prince Phillip, I don't think they curtsy to one another. Why would that be hard to imagine? She doesn't seem to be too fussy about stuff like that. I mean, if they even do it I think it's just a really quick dip and not a full curtsy. Dickie Arbiter who worked for the royals for some time always said they bowed/curtsied to the Queen and Duke of Edinburgh, the other HRH's never did to each other. So I'd take his first hand account as a fairly good authority, though I've also read differently from other good sources. I personally think it's nonsense! I think it's one of the first things that should be done away with frankly, especially in this day and age. But Charles likes a formal lifestyle, and William is said to be a bit of a split personality about it, so who knows what decisions they'll make as monarchs. I doubt they do it on the way to and from breakfast, but they do. Probably more in public situations than private. You know I do wonder how this plays out now that George is around. Kate isn't accompanied by William at this event but she is there with another future King who outranks the blood princesses. I believe they will. Perhaps today or tomorrow...? So now we know - there is an iPad in that black handbag! Along with powder compact, lipstick, handkerchief, and spectacles, all of which I have seen the Queen take in or out of her bag. I like the current solid looking purse, very nice. She no doubt stows the silk scarf in it, too. Totally off topic, what an AWESOME Christmas photos of HRH, Prince Charles & HRH the DOC! Now, on topic, how very much accepted & appreciated must HRH be that the DOE passed on one of his oldest (& most likely) much favored patronages to DOC? As for William supporting his friend at this very sad time, imagine if you will have a friend in his position taking time from family to lend support to someone he has known for years, regardless of the 'timing'. I say high five to Prince William. Merry Christmas everyone, God Blessings on us all. I totally agree, and Merry Christmas Deliah. Do you think Camilla wears a wig? I.suspect she does. Well that would explain why her hair has looked exactly the same for years. But it doesn't look wiggy to me. I would like to know how she gets her hair like that. Wash and set? Blowout? Hot curlers? I think she does or at least a couple hairpeices. I can never see a natural part or a natural hairline. I don't think she has a wig, maybe just a really good hair professional and GREAT products used on her hair. Do you really think a wig could do that?? LOL Also see dark roots in just about any picture of Camilla. Kate has done various styles with her hair (ponytails and updos). So her hair hasn't looked the same for years. Camilla has had the exact same bang/flip combo for decades. And if we are speculating, what about HM? Wig or not? Looking at my 88 year-old mom and neighbours in the same demongraphic (Oh, that typo is too delicious, Dr. Freud. I'll leave it! ), I'd say wig. If you are in the public eye it would only be natural to resort to help of that kind. Though former model Christie Brinkley (61) freely admits to using hair extensions all the time, saying as she got older and her hair got thinner they were a life saver. When I win the lottery, I will have a personal stylist come round and do my hair whenever I want! And with my mop, that's quite a bit. So, where is Lupo? He seems to have disappeared this past year!